With the concept of SOHO (Small Office Home Office) gaining prevalence all over the world, an increasing number of entrepreneurs are looking homewards to create an office space that is as productive as a commercial office would be. 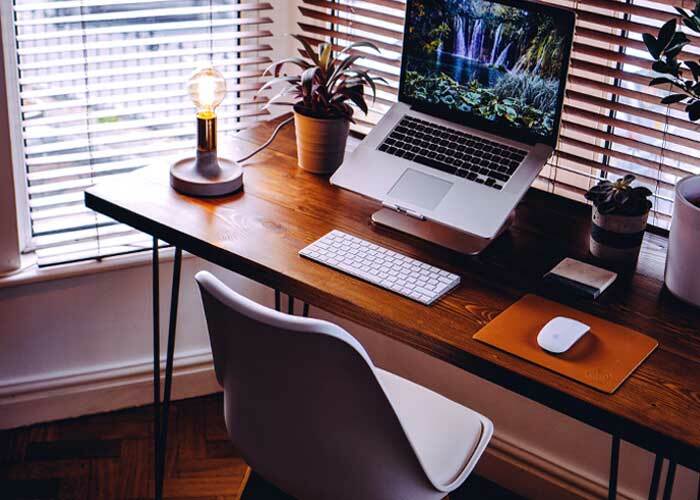 If you want to function well and make a success of your work-from-home setup, you must make sure that the look and feel of your home office are conducive to effective work. You will be surprised to notice how a little bit of focused planning and attention to the decor, design and look of your office space can do wonders for your overall productivity and effectiveness at work. Now that you’ve decided to work from home on a full-time basis, isn’t it the right time to organize your home office space to make it more comfortable and productive? There can be nothing worse than having to work in a poorly lit room! Your home office space should preferably have plenty of natural light throughout the day. A well-lighted and bright space boosts motivation levels and improves effectiveness at work. During the evenings, there should be a provision for enough artificial lighting so that your work space remains well lighted. Bright interiors and a lively work-space are guaranteed to boost your morale and keep you happy and upbeat. A well-ventilated space makes for a perfect small home office. In fact, you should never underestimate the importance of proper ventilation in your SOHO. Before finalizing a spot or space for your office, observe whether or not the area is receiving enough ventilation. If it is possible, try to convert a room with a window into your office space as a nice, airy room can do wonders for your mood and productivity at work. Many people are unsure about working from home as they fear a lack of privacy in their home office setup and rightly so. When you work from home, chances of interruptions increase manifold as compared to working out of an office building. However, some effort on your part can take care of your need for privacy and noise control. Modern-day solutions offer sound deafening features that can be added to your walls. Think about getting strong wooden panels in your office space to get privacy and a bit of seclusion. If noise is an issue, think about investing in a pair of high-quality headphones to keep the sounds at bay. Your Small-Office-Home-Office should be a reflection of your personality. Personalize this space the way you like and watch how your productivity levels soar! To start with, think about all the things that you like; the things that cheer you up and lift your mood – colours, themes, and objects. Now that you know what puts you in a happy space, try to introduce these elements into your home office. Paint the walls of the room or your corner in a colour that you like. Bring in some greenery and freshness by placing small potted plants and fresh flowers. Place a few personal objects such as family photos. Remember, the idea is to personalize your space so that it is to your liking and improves your efficiency, helping you to get more done – every day. To boost your effectiveness at your home office, think about the kind of furniture you would like to use. Working for long hours in front of the computer or sitting in the same position can lead to many postural problems. Hence, make sure to invest in an ergonomic office furniture set that improves your efficiency and helps you maintain a healthy posture. Keep in mind that you should be proud of your home office and should enjoy working there. With a little bit of pre-planning, you can ensure that your small office home office is bright, beautiful, and immensely effective, thus, enhancing your overall work experience. Do you have an SOHO that you enjoy working at? Tell us about it in the comments section below!